Cristiano Ronaldo's move from Real Madrid has seen Juventus's popularity rocket in China, up nearly 70 percent by one measure, as top European clubs vie for supremacy in the Asian country. 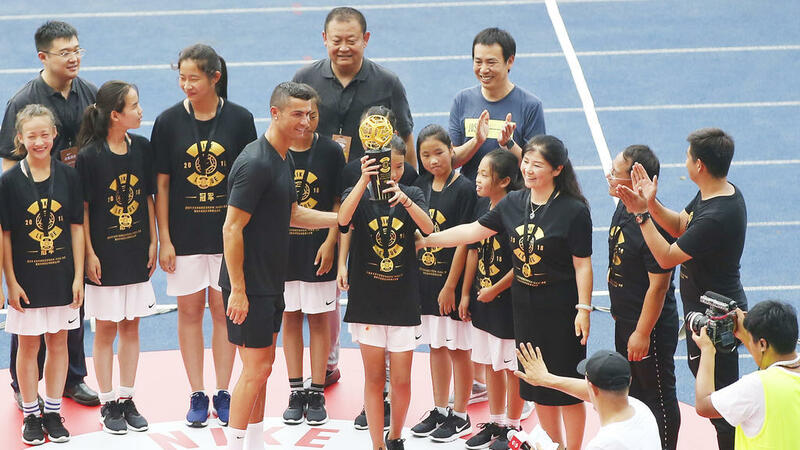 Off the pitch, the Portuguese -- who turned 34 on Tuesday -- has made a similarly emphatic impact in China, the world's second-biggest economy and home to a growing number of football supporters. In the week of Ronaldo's transfer in July last year, Juventus added 308,000 followers across the Twitter-like Weibo, social media and messaging app WeChat, and video app Douyin (known elsewhere as TikTok), the Italian club said. That popularity has held, Juventus say, its number of followers on Weibo jumping 68.5 percent between July and December last year -- a surge in interest that appears undiminished by a police investigation into the star launched last year. More fans ultimately means more money, and suddenly Ronaldo's transfer fee does not look so extortionate. Experts call China an "icon market" because its football fans tend to support an individual rather than a team. "It's beyond football," Giorgio Ricci, chief revenue officer of Juventus, said in emailed comments to AFP, addressing Ronaldo's immense pulling power. "Ronaldo's success in China is not simply connected to his performance on the pitch and achievements over the years. "Players have a stronger influence on (Chinese) fans than teams. "As a matter of fact, fans online have become increasingly interested in individuals, as players have almost 30 percent more combined followers than their clubs." Juventus's gain was Real's loss in China, which along with the United States is a key overseas market for European football clubs. Real may have won the Champions League again, but they suffered a net reduction of about 8,000 followers after Ronaldo's departure, said a recent report by Shanghai-based digital marketing firm Mailman. That said, Real remain hugely popular in China and are still the number one club online in the country, according to Mailman's 2019 "Red Card" report. Ronaldo, who along with Barcelona rival Lionel Messi has won the Ballon d'Or a record five times, has "actively worked towards building a strong image in China", said Ricci. That includes an annual visit to the country and deploying his own Chinese social media channels "to establish a connection with China and shorten the gap with fans".